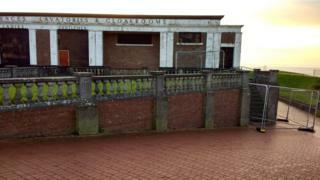 A disused toilet block on Barry Island will be turned into restaurants, Vale of Glamorgan council has said. The Grade II listed shelter at Nell's Point was built in 1923 and has been on sale since 2015. Nextcolour, which turned a 1930s cinema into restaurants at Oyster Wharf in the Mumbles, Swansea, has been chosen to develop the site. Vale of Glamorgan council said it was "another step in the regeneration of Barry Island". The old toilet block has not been used since 1995 and will now be turned into a "number of high-quality restaurants" alongside modern toilet facilities and new beach huts. It follows a number of similar developments across the United Kingdom. Several old public toilets have been turned into restaurants in London and Manchester, while a similar site in Cumbria was earmarked for housing development earlier this year. Councillor John Thomas, leader of the Vale of Glamorgan council said the development would "further boost the area and help cement its reputation as a first-class seaside resort". Nextcolour CEO James Morse said: "We are delighted to have been appointed by the Vale of Glamorgan Council to redevelop the former changing rooms above the beach at Nell's Point." Detailed plans for the development are set to be unveiled early in 2018.